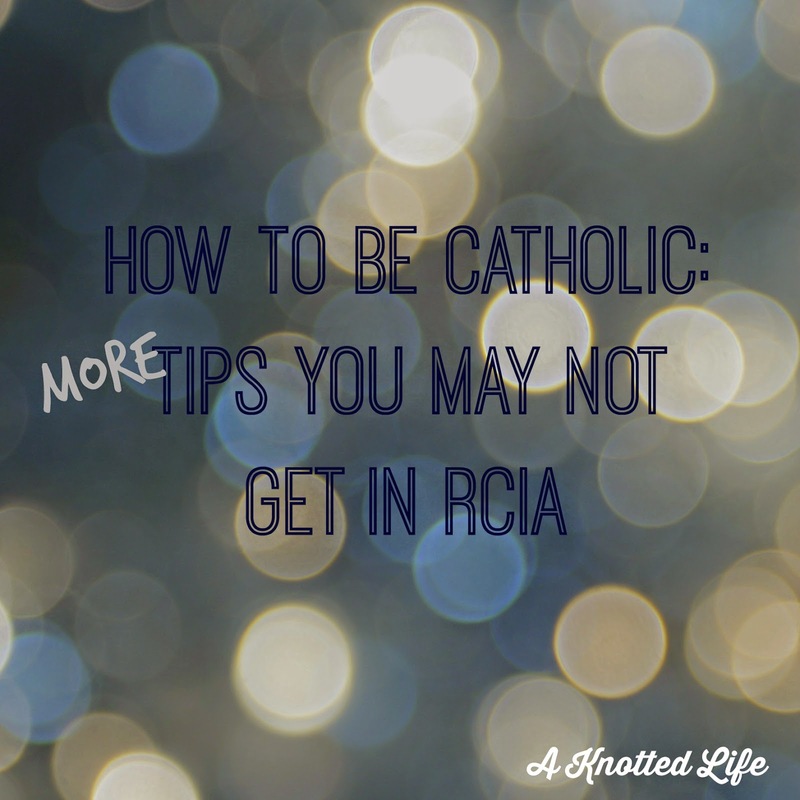 After the first quick list of things you'll want to know as a practicing Catholic but you may not learn in RCIA a few more questions came my way. What can I say? Our faith is beautiful and fun (and true!) but there's a lot of odd little things that we do. So, here's the second edition. 1 - Genuflect towards Christ in the tabernacle. So if the tabernacle is over on the side of the church, turn your body to face it (Him) and genuflect. If you can't find the tabernacle or if the tabernacle is empty for some reason, bow towards the altar. 2 - You will know if the tabernacle is empty because the door will be open and the candle that burns near it will be blown out. 3 - Fast for an hour before Mass. This means you may only have water. If you are pregnant, nursing, elderly, a child, or have a medical reason you don't have to keep this fast. 4 - Technically you only have to fast for an hour before receiving the Eucharist, but most of us fast for an hour before Mass begins. 6 - Generally speaking, at Mass in America we sit to listen, stand to pray and out of respect for the Gospel, and we kneel before the Eucharist. Some parishes stand during the Liturgy of the Eucharist, which is how it is done in some parts of Europe. 7 - Strike your breast three times during the Penitential Rite as you say "through my fault..." And don't just do it, but think about what it means. We're supposed to be truly sorry, so much so that we physically react by beating our breasts. 8 - Bow during the Nicene Creed at the words, "and by the Holy Spirit was incarnate of the Virgin Mary and became man". At Christmas it is traditional to kneel as that line. 9 - Any woman who wishes may wear a head-covering in church. Traditionally, married women wore black and single women and girls wore white, but anymore it doesn't matter. You can wear a veil, a scarf, a hat, a lace infinity scarf, or nothing at all. 10 - To light a votive candle (usually they are located near a statue or icon) you first put money in the collection box to pay for your candle. (You may need to pull a candle out of a box and place it in the candle holder.) Second, take one of the sticks out of the sand, light it from an already-lit candle, light your candle, snuff the stick by returning it to the sand. Or just use a match, whichever is available. Third, say your prayer, asking for the saint / Jesus to continue to pray for your intention. Fourth, pray for the intentions that are represented by the other candles. Coming up next, a not definitive guide on how to pray like a Catholic. What should you do if the Tabernacle is located at the back of the church? For example our churches tabernacle is housed in the chapel room which is located at the back right of the main sanctuary. So basically as soon as I step next to the first pew I'm facing the altar with my back to the Tabernacle. Well that sounds awkward. If I understand you then you should pass in front of the Tabernacle on your way into the church, in which case I would genuflect as I passed it on my way in and out and then I would bow to the altar before I entered my pew. These posts are great Bonnie, and so helpful! Thank you. Thanks for them all, but #10 especially. I have always wondered how to participate in the candles, but never had anyone explain it.